In a move to create awareness and share insights within the e-commerce ecosystem in Southeast Asia, shopping search engine Priceza has recently published a report on consumer behaviour and popular categories in e-commerce. The report was created based on the data of over 130 million buying intent made by Priceza’s users, from 1st January to 31st October, 2016. 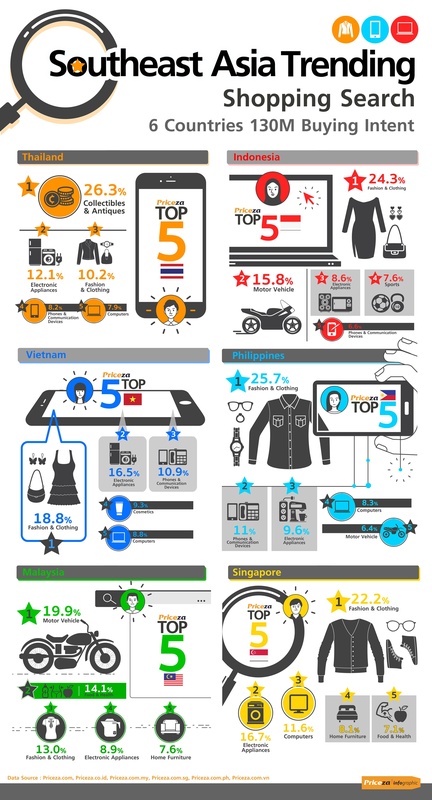 The report conveyed a steady growth in the volume of shopping search and pricing comparison made from 2015; this is especially true for the Fashion and Clothing category which is leading the ranks in Southeast Asia this year. Priceza Malaysia, Philippines, Singapore, and Vietnam reported over 7 million sessions during the mentioned period and sees a growth of over 245% from the previous year (2015); suggesting that e-commerce is only going to get bigger in Southeast Asia. The report shows Thailand and Indonesia to be the leading countries when it comes to e-commerce growth. As per the study, Priceza Thailand recorded over 68 million sessions, with around 130 million pageviews. Among these 6.8 million sessions per month, 63.27 per cent were conducted through mobile devices, while the percentages of desktop and tablet users remain at 29.98 and 6.75 per cent, respectively. In addition, the data indicated that 55.2 per cent of all users in Thailand are male, while 44.8 per cent are female within the age group of 18-44 years. When it comes to Priceza Indonesia, the company reported around 42 million sessions during the mentioned time period, with 62 million page views. Among the 4.2 million sessions per month, 70.92 per cent were through mobile devices, 25.14 per cent were from desktops and 3.94 per cent were from tablets. When it comes to the demographic segmentation of the users, Indonesia shows male and female users of the age between 18 to 34 years as 63.2 and 36.8 per cent, respectively. While the overall search data shows a great increase in number of users, the in-depth report offers insight into the shopping patterns and preferences of the users as well. In the case of Indonesia and Malaysia, one can see an increase in the search numbers for Motor Vehicle category. Compared to 2015, the search numbers have increased significantly due to the initiatives from the Government of Indonesia. Not only domestic sales, Motorcycles Exports have also gone up in Indonesia by 87% per cent in February, 2016. Motorcycles being the major transportation mode in Southeast Asian countries, the rise or fall in Motor Vehicles sales significantly displays the purchasing power of the population here. The report was published in line with Priceza’s core value to make the e-commerce system transparent. On one hand, the reports will give businesses the necessary insight into consumer behavior, while on the other hand, it intends to encourage consumers to make informed purchasing decision.